The death was the first in the North California fire. The largest fire in California history turned deadly on Monday as a firefighter tending the blaze was killed. There were few details on how the firefighter died in the Mendocino Complex Fire, northeast of Ukiah, California. 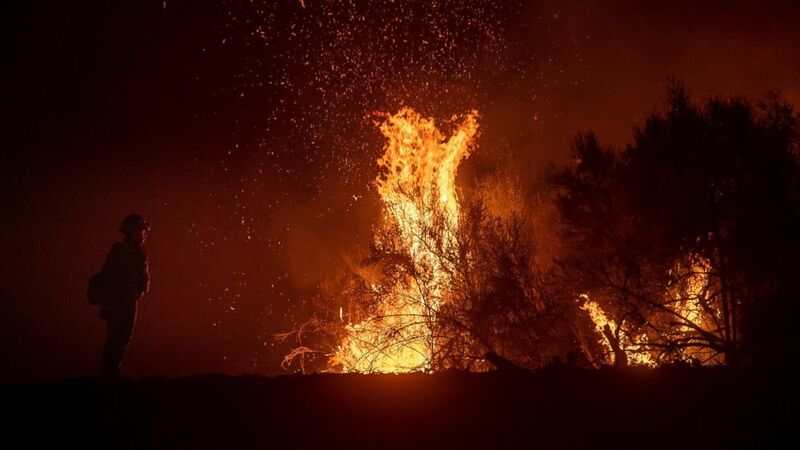 The fire is burning near the Mendocino National Forest, about 140 miles northwest of Sacramento. "The Mendocino Complex Unified Incident Commanders from CAL FIRE, and the United States Forest Service are deeply saddened to report the death of a firefighter on the Mendocino Complex," CAL FIRE sad in a statement. "Fact finding on the accident is ongoing and notification of the next of kin is in progress. More information will be released as it becomes available." Officials said the firefighter was from Utah and was injured while working an active part of the fire. He was airlifted to a local hospital where he died from his injuries. The fire became the largest in state history last week, passing the Thomas Fire from December 2017 as it grew to over 283,000 acres. The fire has now grown to over 349,000 acres, but the Ranch Fire -- one half of the Mendocino Complex Fire -- is up to 59 percent contained. The fire season has already been a hard one for firefighters working dozens of fires, especially in California. (AP) A firefighter monitors a backfire while battling the Ranch Fire, part of the Mendocino Complex Fire, on Tuesday, Aug. 7, 2018, near Ladoga, Calif.
Two firefighters were killed in the Ferguson Fire, which began on July 13 in Mariposa County, east of San Jose and burning in part of Yosemite National Park. Brian Hughes was killed on July 29 when he was struck by a falling tree. Hughes was the second firefighter to die in the blaze after Braden Varney was killed July 13. “We are extremely heartbroken from this loss." The Carr Fire has been the deadliest of the wildfires to hit the West this season. Three firefighters have died in the blaze, which started on July 23 and has burned through 206,000 acres and destroyed 1,077 homes near Redding in the far northern Shasta County in California. CAL FIRE officially lists two firefighter deaths in the blaze, though San Francisco ABC station KGO reported a third firefighter, Andrew Brake, was killed in a car accident traveling to the fire. Five civilians were killed in the Carr Fire as well, including a worker for Pacific Gas & Electric. Progress has been made, as the Carr Fire is now up to 63 percent contained, according to CAL FIRE. This year has been the deadliest for firefighters since 2008, according to SF Gate.